@arbuzzy - A calligrapher and printmaker, Ashley shares a mix of calligraphy and hand lettering interspersed with general life. @andreasmhansen - Based in Copenhagen, there is all sorts of lovely typography and hand lettering on this feed. @evablack_ - lots of lovely type and patterns on this feed with lovely photography - I also really like the close up details. @chelseapetaja - If you like beautiful type and flowers this feed is for you - lots of inspiring treats and beautiful details. 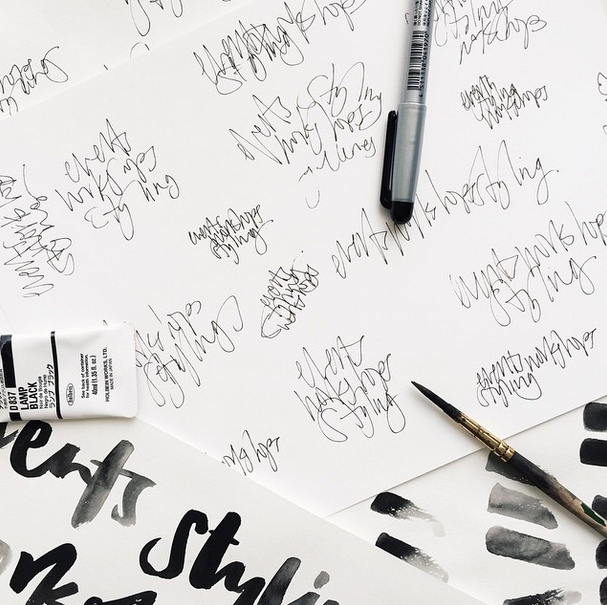 @sabinepick - A custom calligraphy studio, this feed is full of calligraphy and I love the messy style and behind the scenes shots. @Biancacash - I love this girl and her hand lettering is top notch. Her feed is a combo of lettering and dreamy photographs. @juliesongink - a mix of type and watercolour goodness. Lots of calligraphy for weddings and invitations. So there you have it. Hopefully there are some new ones here that you were not aware of and you can get stuck in enjoying them all. Happy Friday! Hope you all have a lovely weekend!